First a bit of history: The Green family first discovered Emerald Isle back in the early 1990’s. We were stationed at Seymour Johnson AFB in Goldsboro and it was an easy day-trip or weekend getaway; load up the van with the kids, cooler, beach toys, boogie boards, and umbrella then head down Highway 70 for the Crystal Coast. We visited many of the great beaches near us but absolutely fell in love with Emerald Isle—it became our favorite. Our tour in Goldsboro ended in 1994 and we moved on to Omaha, NE and then, subsequently to Dayton, OH. 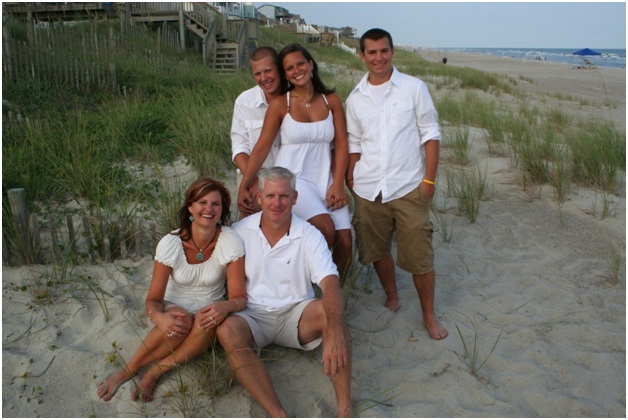 As we met new friends, we raved about the beautiful North Carolina beaches and the fun our family had there. While stationed in Omaha, we met and became friends with the Muckey’s—our best and longest lasting friends. We did everything together in Omaha and kept telling them that we just had to get them to Emerald Isle. In 1998, I had a career change and we moved to Beavercreek, OH, a suburb of Dayton. Our families were heartbroken to be separated but we promised to keep connected and to get together often. During the fall and winter of 1998 we kept in touch as best we could and in the spring of 1999 we made plans to vacation together that summer. We were thrilled that we were going to see our dear friends again and that we’d be introducing them to Emerald Isle! The first of our several Emerald Isle traditions begins as we cross over the bridge on Hwy 58 leading from the mainland to Emerald Isle—blasting the car audio system to Jimmy Buffett’s version of “Brown Eyed Girl” with the windows down and our voices serenading those lucky enough to hear! The very first time we visited Emerald Isle with the Muckey’s and were crossing the bridge we were listening to our Jimmy Buffett CDs and ”Brown Eyed Girl” played. As we crested the top of the span and took in the view, we rolled down the windows, smelled the fresh ocean air, and everyone in the van began singing at the top of their lungs. How bad we felt for those poor souls leaving the island. They certainly must have been jealous of the fun we were already having as we crossed the bridge to start our vacation. We re-enact this scene every time we arrive—and believe me the music is cranked-up and our singing is just as loud and off-key! One of the next traditions–not exactly our favorite, but a tradition nonetheless–is the great logistics exercise of unloading the vehicle and heading to the Emerald Isle Food Lion. The men and kids usually get the chore of unloading all the various suitcases, coolers, grills, boogie boards, beach toys, beach chairs—well you get the picture. No matter how hard we’ve tried over the years, we always end up with a van load with every possible square inch of storage space utilized. It’s also amazing that the men usually end up carrying everything in as the kids mysteriously disappear down the walkway and onto the beach. No matter how many times we’ve pre-briefed our plan for unloading and putting things away, the kids somehow get a case of “beach amnesia” and forget everything we’ve said about helping out. After dropping our belongings at the beach house the next part begins—going to Food Lion. As this tradition goes, the wives go food shopping while the husbands and kids (OK, we know it’s not the kids!) put the house in order. A couple of hours later, the wives return and the men (See? No references to kids this time) carry in and put away the week’s groceries. The best part of this tradition (sarcasm intended) is that the men get to return to Food Lion almost every day to get more ice, soda, ice crème, freeze pops, chips, pizza rolls, bread, peanut butter and anything else that we’ve forgotten or need. Our next tradition is much more enjoyable and is one we always look forward to. Living so far away from the coast, we really enjoy the great fresh seafood that we are able to get while visiting Emerald Isle. Of course, there are many good seafood restaurants in or near Emerald Isle. We choose, however, to cook our own and will visit Captain Willis Seafood shop every single day. When our children were young they would enjoy going to Captain Willis’ to see the great variety of fresh seafood available there. They were especially intrigued by the tray of soft-shelled crabs blowing bubbles. Some were even brave enough to touch them. Now as they’ve grown, each has their favorite fish or seafood that we make while there. Our tradition is to let them plan a meal around their individual favorites. The only caveat is that the parents get to choose to have grilled grouper once during the vacation—OK, so we actually have grilled grouper twice; after all, we’re paying for it and face let’s face it, you just can’t get enough of fresh grilled grouper. The tradition of “The Turning of the Chairs” began that very first vacation with our friend’s the Muckey’s. Back in 1999, our children were all fairly young. That first year, on our first full day on the beach, the kids had pretty much worn themselves and us out! It was late in the afternoon and they had all trekked back through the sand, up the boardwalk, into the house, and had collapsed in front of the TV watching a Disney movie. Of course, we parents were tired as well, but having gotten the kids settled in the house we decided to stay on the beach of few more minutes to enjoy the late afternoon sun… and peace. We all opened a cold beverage and just sat facing the ocean. What a beautiful dark blue the water was. How fresh and clean the air smelled in the sea breeze. It was in a word, perfect. Or so I thought. There was one small issue…the sun was now to our right as we faced the ocean. Well, this was a problem. How could our wives maximize their tanning opportunities while the sun was in the wrong place? The answer: “The Turning of the Chairs!” What a brilliant idea! I’d like to say I thought of it, although with the passage of time I’m not sure who deserves the actual credit. For those of us with the beginnings of a sunburn, no matter how much SPF 45 lotion had been slathered on, it was the perfect opportunity to turn about and face away from the sun. What a concept! One could turn the chairs and face each other to talk. As we sat there enjoying each other’s company, eating spicy Cheese-Its, and enjoying a cold Corona we had found, as the song says, “ … our own kind of paradise.” With the sun beginning to slowly descend our moment of splendor was interrupted by the sounds of our children shouting down to us, “What are you guys doing down there?” We looked at each other, shrugged, and answered, “We’re turning the chairs!” At first the kids looked at each other with a look of confusion, and then, they made their way back down to join us. We sat, talked, laughed and thoroughly enjoyed the beautiful late afternoon and setting sun. Now, each time we make our pilgrimage to Emerald Isle the Turning of the Chairs has become an almost sacred daily ritual. The best part is, as our children have grown into young adults, they too look forward to the Turning of the Chairs. It has become that special time of the day when we all gather to reminisce and share our special memories. It is full of stories of past beach weeks; the time one of the boys lost his trucks in the surf; or the year we sat out one 4th of July and watched the fireworks up and down the entire coast; the times we’ve watched a pod of dolphins swim up the coast; or the time we all built the world’s best and largest sandcastle. How precious that time spent turning the chairs has become to all of us. This past summer the Muckey’s were unable to join us during our week at Emerald Isle. The Green’s still turned our chairs but it somehow wasn’t quite the same. The cold-hard fact is that time marches on and our lives and circumstances change. There is, however, a happy ending to this tale of traditions. Though we greatly missed the Muckey’s this past year they will be going back with us next year! They are as excited as we are to reunite at Emerald Isle. Even more special is the fact that we will be introducing another family of dear friends to Emerald Isle this coming year! The Martin’s of Ann Arbor, MI will be joining the Green’s and the Muckey’s. They too have heard our wonderful stories and look forward to experiencing our many traditions. We can hardly wait for that special time when the Martin’s experience all the best of Emerald Isle and our favorite family tradition–The Turning of the Chairs.